1 - WATCH AND PRAY. 2 - The season of Lent is nearly over. 3 - Five weeks ago, some of us may have made some promises to ourselves and to God. 4 - This year, I'm giving up chocolate for Lent. 5 - This year, I'm giving up television for Lent. 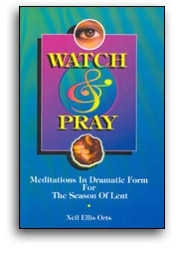 6 - This year, I'm reading a book on prayer for Lent. 7 - This year, I'm giving extra money to charity for Lent. 8 - These are the things we might choose for a Lenten discipline. 9 - Lenten disciplines help to remind us of the time of the year.